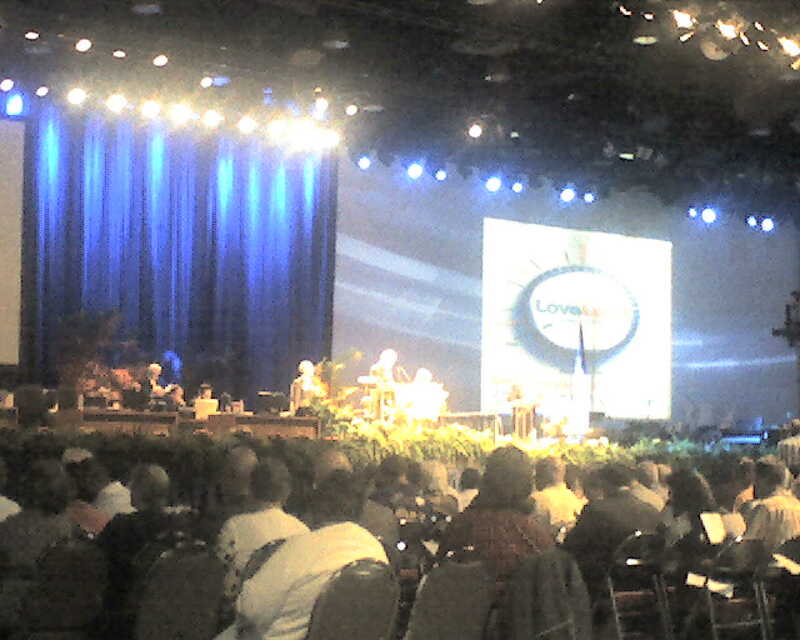 Here are some pictures from the convention this past week. The chapel picture on the top is from the Sesquicentennial (150th) Dedication of the Southern Baptist Theological Seminary. This was my first time at a chapel service at the seminary. 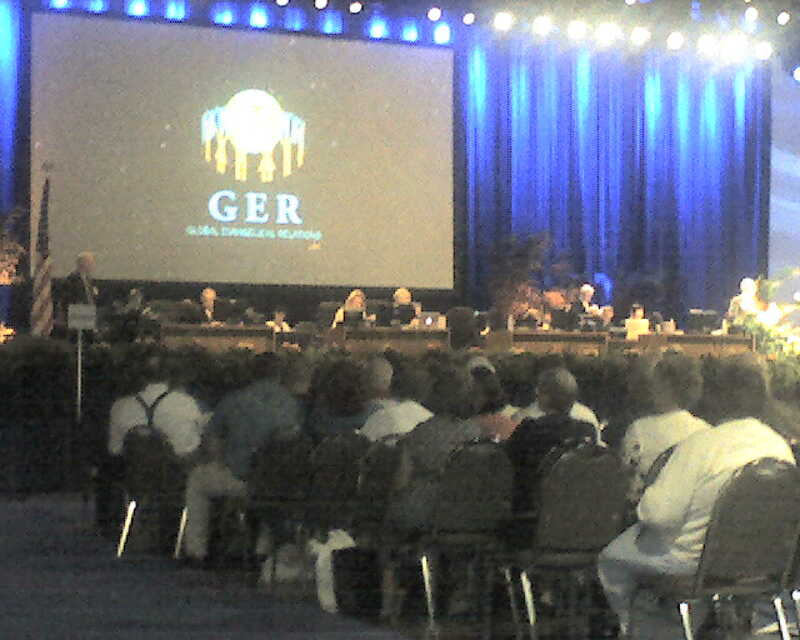 The other two shots are pictures from our “best” seats at the convention on Tuesday afternoon. What are my thoughts on the convention? 1. It was not as highly attended as I thought it was going to be. I have a book that I had to read for the seminary class that had on the cover of the book a picture from the 1988 SBC Annual Meeting in San Antonio, TX. In that picture, there is an entire stadium filled with SBC messengers (looks like well over 20,000 people). This convention only had a little over 8,000 messengers and it was in a convention hall at the Kentucky Expo Center in Louisville, KY.
2. There was not all that much controversy. This is not a bad thing. But, due to the preparation seminar that we had at the Seminary class on Saturday (6/20/2009), Dr. Russell Moore (Dean of Theology at Southern Seminary) mentioned what to expect and I left with the impression that there would be some debate on the floor especially with the Great Commission Resurgence and also about the possible disfellowship of Broadway Baptist Church in Fort Worth, TX. As it turned out, the Broadway Baptist Church disfellowship recommendation by the Executive Committee passed without discussion and the Great Commission Resurgence was passed whole heartedly without much debate (it was the only “controversial issue). 3. There was one resolution that was most publicized in the media. It was a resolution on President Barack Obama. The resolution celebrated the fact that an African American was elected to the highest office in the United States. However, it also lamented the positions that the Obama administration was taking on the abortion issue and pro-gay rights. Here is the Baptist Press article about the resolution [http://www.bpnews.net/BPnews.asp?ID=30759]. You will notice in the article that Dr. Roger “Sing” Oldham is in the picture with Danny Akin and Richard Land. Akin is the President of the Southeastern Baptist Theological Seminary and was also chairman of the Resolutions Committee for this year’s convention. Richard Land is the Chairman of the Ethics and Religious Liberty Commission of the SBC. 4. The Exhibit Hall of the SBC was absolutely amazing! There was an entire Lifeway Christian Store in the middle of the hall. Also there were unbelievable exhibits from every seminary and entity of the SBC and also all the Christian Colleges in the states. I am proud to announce that Union University probably had the best location in the entire hall, right at the entrance! Bonnie and I especially enjoyed the International Mission Board exhibit. There was a huge board that had a map of the entire world with indications of the percentage of evanglical Christians in each location. Each messenger had the opportunity to sign his or her name in a region of the world to pray for the missionary effot to reach that part of the world for Christ. I picked Russia, since Breanne Oldham (Dr. Sing Oldham’s daughter and fellow classmate) is currently in that country as a journeyman missionary. 5. Bonnie and I attended the Union University Alumni dessert reception on Tuesday evening. It was a wonderful event. Dr. Dockery informed the guests that Union is having a record Freshman enrollment this year. Things are doing great for my alma mater! 6. I got to meet a bunch of new ministers my age throughout the country and also got to meet and “rub shoulders” with some of the leaders of the convention. It is neat to be walking around the exhibit hall and then turn around and there is R. Albert Mohler walking right by you, or Thom Rainer, Jerry Vines, Paige Patterson, Richard Land, etc. I also got to see some familiar faces. It was definitely great to see Brother Wayne and Linda Perkins and also Eddie Mallonee and his wife. We also saw Jim Barnhouse from Macks Grove Baptist Church. All in all, I thoroughly enjoyed the convention and am thankful that the church has allowed me to go. I look forward to the next time I will be able to go. I am now at the hotel room after the Tuesday session of the Southern Baptist Convention. I am completely exhausted after a fourteen hour day at the convention hall. I will most likely not post until I am home in Weakley County, TN on Thursday evening. Monday Morning: What if we had the same love? 1. Mike Landry, Pastor of First Baptist Church Sarasota, FL. II. How do we maintain missions and have “same love”? A. View the Great Commission as a relational mission. 2. Ed Stetzer, President of Lifeway Research and Interim Pastor of Hendersonville First Baptist Church. Main Point: God has already made us one, we just need to live it out. Did not get much of an outline from Pastor Chan, but he did an amazing job. Francis is a native of Hong Kong, China and is a pastor in California. I enjoyed his genuine, no-nonsense approach. 4. Tom Eliff – did not get to listen to his sermon. Bonnie and I went to eat lunch. Afternoon Session – What if…we were One in Spirit? Michael did not have a full outline and he basically preached an encouragement sermon for young and old pastors alike. Good words. 2. Dennis Swanberg also spoke. He is a Christian Comedian and he was hilarious. He started off the bit by imitating Billy Graham and he sounded just like him! Swanberg has just written a book called, The Man Code. 4. Mike Huckabee: everyone knows who he is. He spoke mainly about the roles of the family, the pastor, and government. He made the basic point through his speech that we are not to be like Abimilech in Judges 9. Monday Evening: What if…we were one in Purpose? 1. Alvin Reid, Professor of Evangelism at Southeastern Baptist Theological Seminary. 2. David Platt, Pastor of the Church at Brook Hills in Birmingham, AL. David Platt, in my opinion, was by far the best preacher of the conference and he is only thirty years old and a pastor of a vibrant church in Alabama. David Platt told the conference that the one purpose for us is the GLORY OF GOD! His text was out of Hebrews 13:11-14. The major question that he offered was: Are we going to die in our religion, or are we going to die in our devotion? I simply stopped writing notes and sat down and listened to Platt preach the gospel. He really drove home the need for global missions awareness and the fact that the Gospel of Christ is on the march among the nations. 3. Johnny Hunt, Senior Pastor First Baptist Church in Woodstock, GA. Johnny Hunt is the current and presumed re-elected President of the Southern Baptist Convention. I did not take notes on his speech, but it basically was an exegesis of Malachi and was a stirring sermon on being dependent upon the LORD. Overall, I truly enjoyed the Pastor’s Conference. 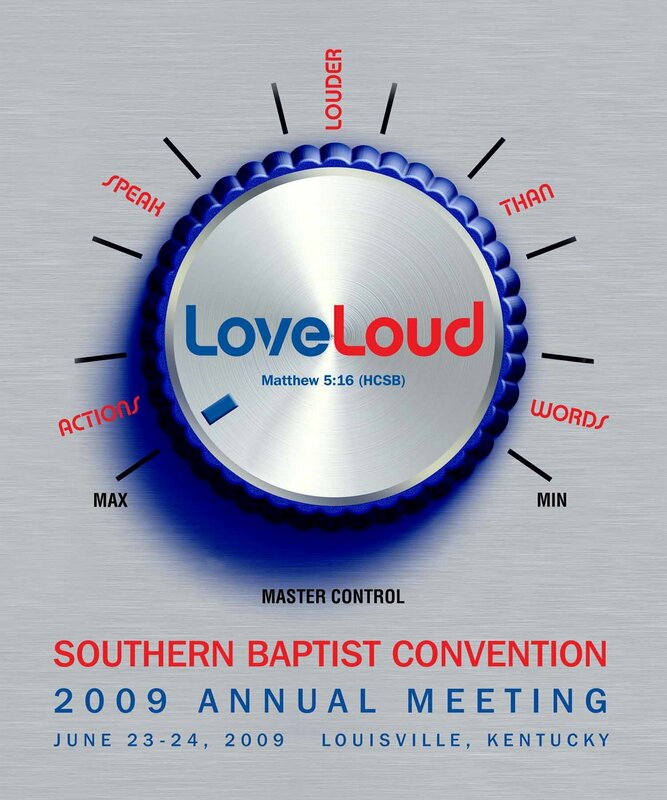 Tomorrow, I am looking forward to the first day of the actual Annual Meeting of the Southern Baptist Convention. Tomorrow morning, it has been announced to my Seminary class that we will be asked to join the leaders of the convention on the platform of the annual meeting of the SBC for us future pastors, pastoral staff, missionaries, and denominational leaders to be prayed over by the convention. 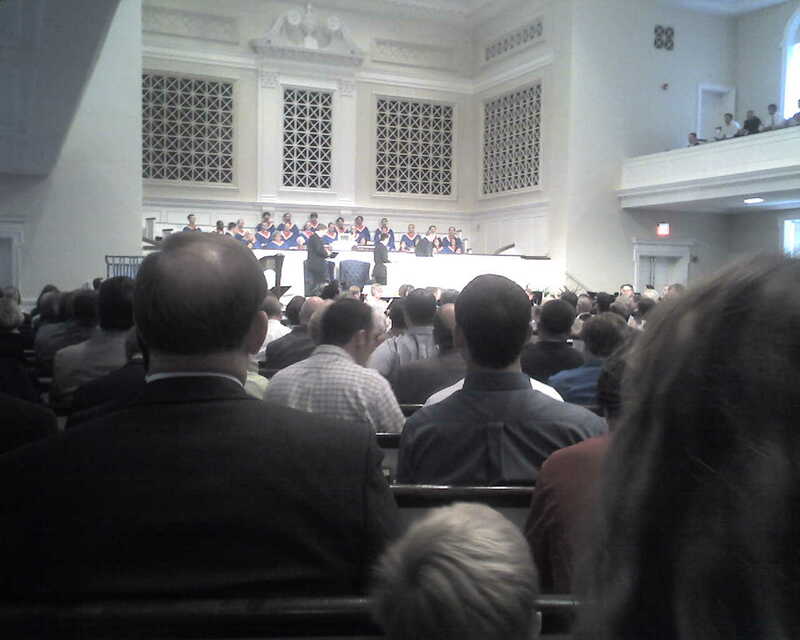 Since the convention is at Louisville, KY Southern Seminary, its leadership and students are being spotlighted. Another neat feature of my involvement in the SBC is that each of the students of the Southern Seminary students, including myself, will have to serve as microphone monitors for the convention business sessions. My session will be on Wednesday morning and will be manning microphone 5. This means that we have the responsibility of manning the microphones and operating a digital microphone computer box that will indicate to the chair of the convetion (Johnny Hunt) what the person at the microphone will be doing (making a motion, speaking for or against the motion, making an amendment, and making a point of order). This is the first year that the microphones will be digitally connected to the platform and the system is simple, yet complicated (sort of like touch-screen voting machines). I anticipate that it might get complicated. The recognition of seminary students should be at 9:00am EDT (that is 8:00AM central). >Bonnie and I arrived in Louisville for the Southern Baptist Annual Meeting and seminary class last night after leaving Martin in the early afternoon. This whole day (9:00am – 4:00pm) I have been in a lecture session with my 100 classmates with Dr. Russell Moore. Dr. Moore spent the day getting us all prepared for what an annual meeting usually looks like. He also outlined the origins of Baptists in the 17th Century England and also the formation of the Southern Baptist Convention in the United States in 1845 and the denominational distinctives that make Baptists unique from other denominational groups. We also studied the details and breakdown of the Southern Baptist Cooperative Program and also were introduced to some controversy that the Southern Baptist Convention is experiencing over the funding of convention agencies. At the end of the day, we covered the Conservative Resurgence in the Southern Baptist Convention that started in 1979 (this convention marks the 30th Anniversary of that event). The Pastor’s Conference starts tomorrow evening. I will share my notes on this blog each night after the events of that day.